Snow and ice accumulations will "only" end up in the light to moderate range, as warming temperatures eventually force a transition to all rain. However, there are going to be some challenging travel conditions. Especially during the Monday morning, Monday evening, and Tuesday morning commutes. The inconvenient timing makes this a storm worth worrying about. Our latest orecast for this messy week of snow, ice, and rain as of Sunday morning. This is not a "bread and milk" storm — the state is not going to be shutdown for days on end, and you're not going to get snowed-in at home. But you might be stuck in your car for long periods of time, given the slow traffic on slushy roads. Hmmm, what's the vehicular equivalent of bread and milk... Gas and coffee? And plenty of patience, of course. Is this going to be The Winter That Wasn't? Our only significant storm so far this season was the mid-November over-performer (#Brinegate). Throughout the rest of the winter, we've been "shoveling rain," with only occasional bursts of snow and ice. This week's storm appears to be no different. Just to catch you up on climatology, in case you're playing along at home... So far, Newark Liberty International Airport has recorded 7.3 inches of snow since July 1 — less than half of the season-to-date normal of 16.7 inches. At Atlantic City International Airport (technically in Egg Harbor Township), we've had 10.9 inches of snowfall — believe it or not, very close to the season-to-date normal of 10.7 inches. Attribute that near-normal value to 1.) the number of "South Jersey special" storms we've had this year, and 2.) the relatively low average annual snowfall in southern NJ. Despite what Punxsutawney Phil had to say, winter is far from over. March is traditionally a violent weather month. As the seasons change, we are still prone to experience strong nor'easters and bitter cold. (Reference last year's quadruple nor'easter March!) It ain't over until it's over. The National Weather Service has issued a Winter Weather Advisory for the southern half of the state, from 10 p.m. Sunday to Noon Monday. This includes the following 8 counties, generally along and south of Interstate 195: Atlantic, Burlington, Camden, Cape May, Cumberland, Gloucester, Ocean, and Salem. 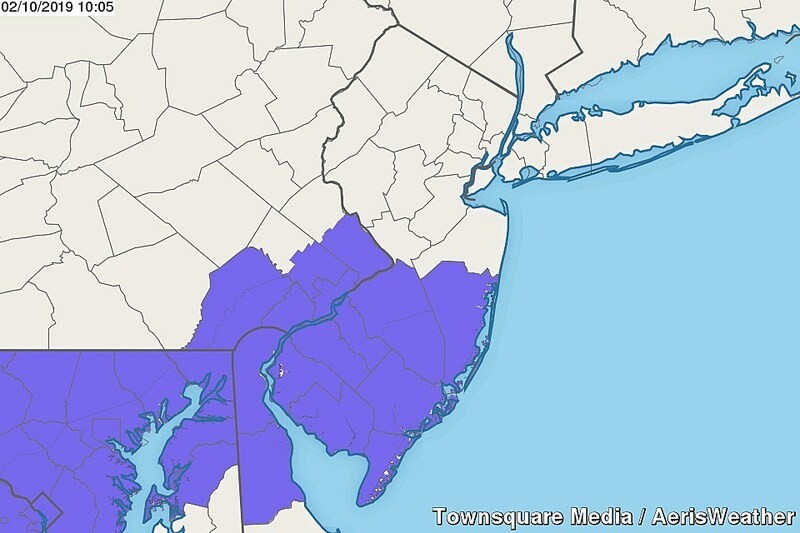 A Winter Weather Advisory has been issued for southern New Jersey from 10 p.m. Sunday to Noon Monday. This advisory covers only the "first round" of snow, and calls for 2" snowfall and perhaps a light glaze of ice. I agree 100% with the placement, timing, and reasoning behind this advisory. "A Winter Weather Advisory means that periods of snow, sleet or freezing rain will cause travel difficulties. Expect slippery roads and limited visibilities, and use caution while driving." I don't it's technically correct to break this storm into a "part one" and "part two" anymore. Precipitation will probably be on-going across New Jersey, somewhere, in some form, from Sunday evening through Wednesday morning. —9 p.m. Sunday... First flakes push over the Delaware River into southwestern New Jersey. —Around Midnight... Snow begins for most for most of the state. —Overnight... Light snow will continue falling, with bands of moderate snow in the southern half of New Jersey. —Monday Morning... Snow and slush may cause significant slowdowns and school delays. —10 a.m. Monday... Snow tapers off for most. —Monday Daytime... Most of NJ enters a lull, although wintry mix and/or rain may continue to clip Cape May County throughout the day. —3 p.m. Monday... Precipitation surges northward again. As temperatures drop, this would cause snow to once again spread through the state. —Monday Evening... Evening commute hampered by slushy, icy roads and reduced visibility. —Monday Night... Snow bands continue edging northward, leading to additional accumulations across the state. —Early Tuesday Morning... Rising temperatures force a transition from snow to icy mix to rain. For the southern half of the state, this changeover should be complete (or at least underway) by the Tuesday morning rush hour. 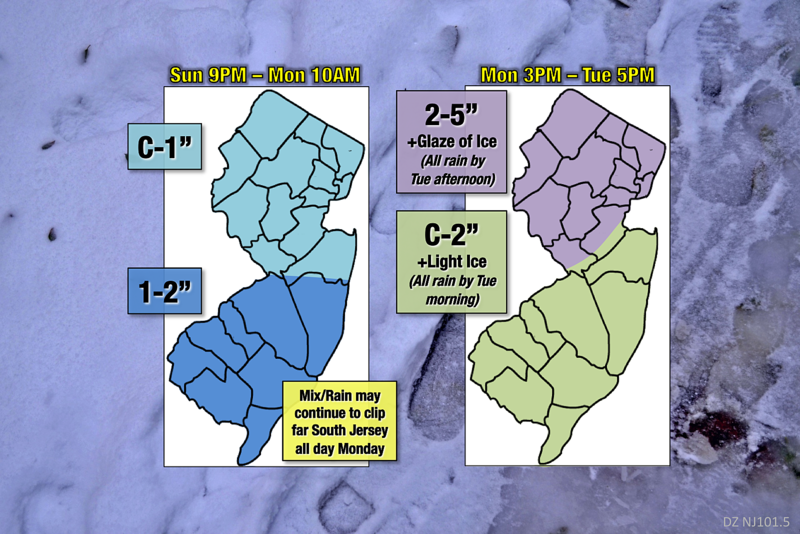 —Late Tuesday Morning... North Jersey changing from snow to ice to rain. A period of sleet and/or freezing rain could make conditions extremely slippery in the northern half of the state. —Tuesday Afternoon... Most of New Jersey rain now. Some wintry mix may linger in far North Jersey (north of I-78). —By 5 p.m. Tuesday... Transition complete. All rain. —5 a.m. Wednesday... Storm exits New Jersey and rain comes to an end. 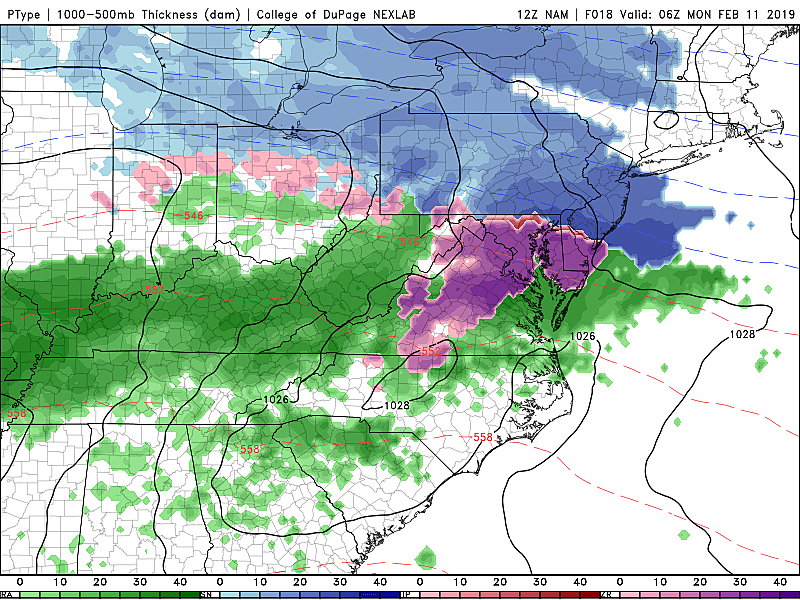 Allow me to quote, umm myself, from Saturday's CMDZ weather blog: "The timing and speed of the snow-mix-rain transition are especially tricky to pinpoint. 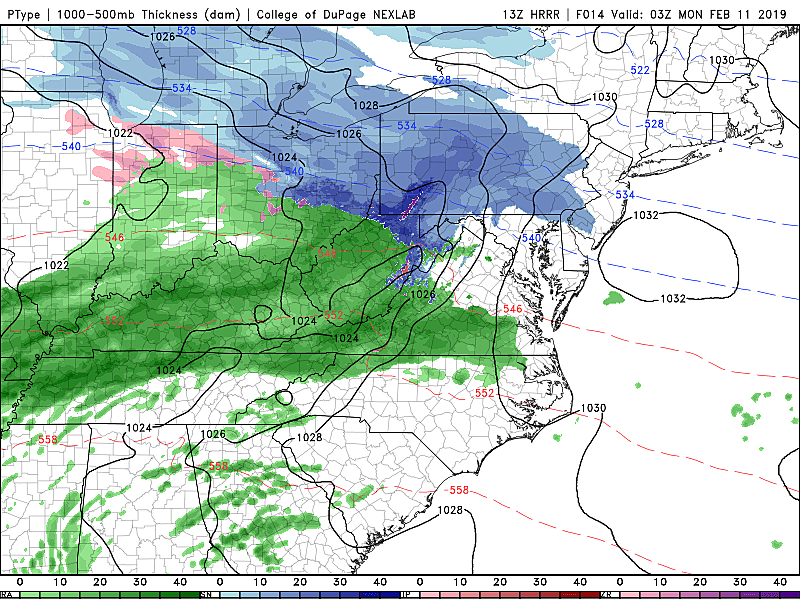 And ultimately that is what determines how much snow/ice/rain any given spot will see. As always, I will encourage you to blur your eyes and read between the lines in this forecast. Don't focus so much on the numbers, but rather my overall narrative." Weather and roads are going to become pretty poor Monday into Tuesday. Period. Full stop. Having said that, let's talk about totals. —South of I-195, by Monday morning... I'm still thinking an inch or two is likely from the first burst of snow. Small-scale bands of heavier snow seem to be a good bet, but pinpointing exactly where they set up is impossible. Would I be surprised to see a few 3+ inch totals? Nope. But such totals will be isolated — the exception, not the rule. —North of I-195, by Monday morning... Not really your storm, North Jersey. (Not yet, at least.) Although roads could still get slushy and slippery with up to an inch of snowfall by Monday morning's commute. Don't be surprised if you don't see much through early Monday — the heaviest snow bands stay south. —Southeast of Route 1, by Tuesday morning... The first to see the reintroduction of snow, but also the first to transition to all rain. The big questions: How fast will that burst of snow fall and accumulate? How fast will snow turn to rain? I've crafted a larger-than usual range of snow totals to account for these yet-unknown answers. Expect anywhere rom a coating to 2" of snow — the bulk of which will fall pre-Tuesday morning commute. The switch from snow to rain should flip quickly in the southern half of the state, so there is only a slight chance for icy mix here. The sooner the changeover, the less snow and the more rain there will be. The longer the changeover takes, the greater the icing potential. As I've said before, it doesn't matter what's falling from the sky. And it doesn't matter how much salt and brine road crews use. There will be messy road conditions through several rush hour periods. Monday morning just looks a little bit snowy, with slushy road conditions also possible in South Jersey Monday evening. 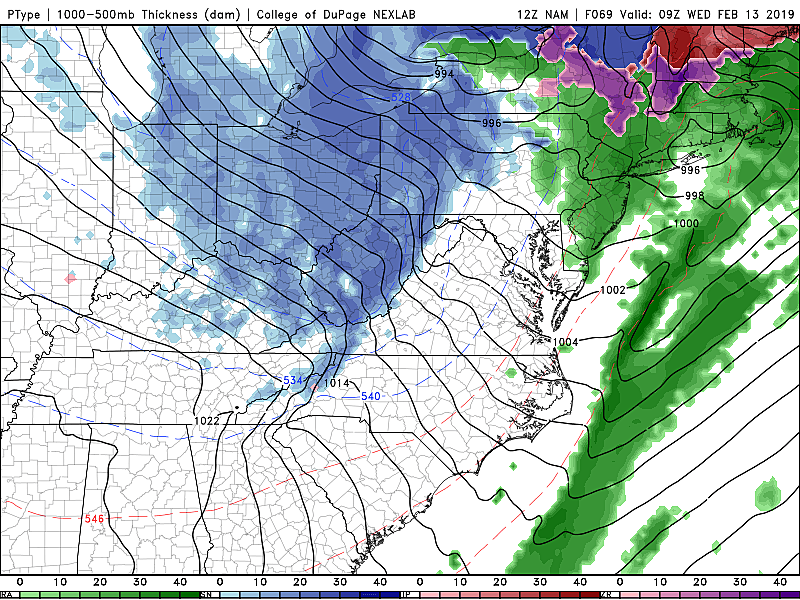 Tuesday morning is the one I'm really worried about, as we'll be right in the middle of our snow-ice-rain transition. By Tuesday evening, hopefully roads will just be wet (still a slippery situation, of course). 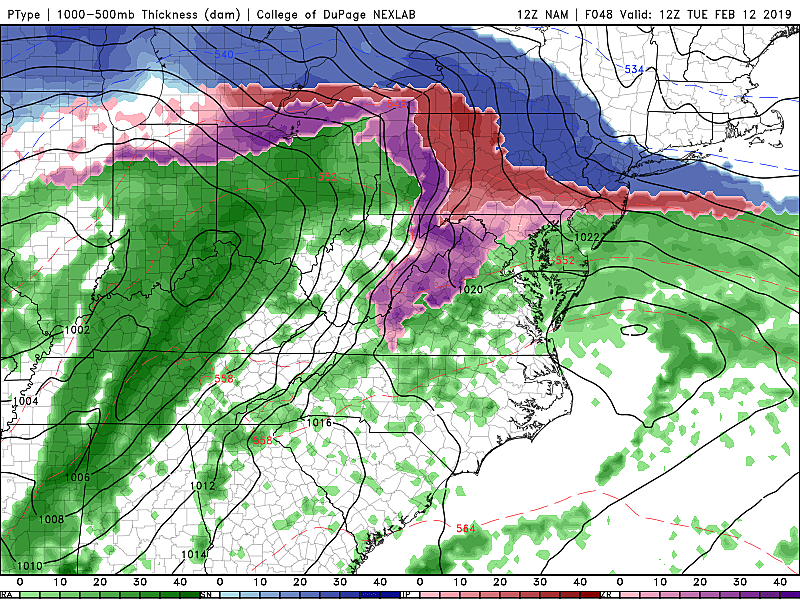 Furthermore, if the worst-case "glaze of ice" scenario plays out, that heavy ice may bring down trees and lines, causing scattered power outages. The next storm system is progged for the Friday evening to Saturday afternoon time frame. As a surge of warm air precedes this system, it's looks like it will be rain, rain, rain to start. However, as colder air arrives after Noon on Saturday, we could see a quick hit of backside snow to end the storm. If the ground isn't too wet or warm, I could see an inch or two of accumulation by Saturday evening. Our next next threat for a storm wouldn't come until the middle of next week, around the 20th or 21st. Long-range models are currently showing some healthy snowfall. But you'd have better luck flipping a coin than getting a 10-day forecast right. As usual, it's worth watching. We wouldn't start talking details until early next week, at the earliest. Unless something changes dramatically with this afternoon's model runs, this will be my last update before our storm begins. My next weather blog update should be posted by 7 a.m. Monday. Be safe out there tonight!